So we were finally able to find some chinese cabbage and radish in Lilongwe the other day. Joy and I have been waiting for it to come into season so that we could get back to our Korea-era routine of eating stupidly large amounts of kimchi and rice. 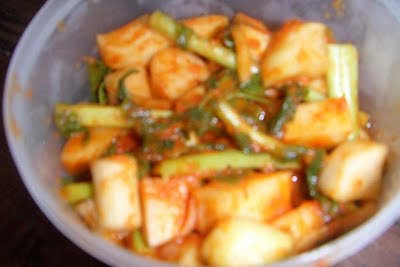 Joy spent the whole day making kimchi and then we devoured it for dinner. Not to worry though, we still have another couple kilograms of the stuff. Down at the lake we've been having fun taking out our diver propulsion vehicles (DPVs). These little "underwater motorcycles" are a great way to explore new parts of the lake. In the news check out this pair of articles on Kamuzu Banda's rightful place in the history of Malawi. This guy is for the him, this guy is against. You decide. Development in Lilongwe is still going strong as far as I can tell from our short trip there. A new Spar (large western-style supermarket) is scheduled to open soon and Chinese-owned shops in newly built buildings are still sprouting up all over the place. These people continue to intrigue, baffle, and impress me. Finally we met our Tonga (the local langauge here) teacher, Alfred, and are having our first lesson today. It was difficult to decide which language to learn. Like almost every African country, Malawi has numerous languages that are widely spoken. ChiChewa is certainly the most dominant. Many Malawians call it their "national" language because Banda promoted it as such however that policy was highly controversial in many parts of the country where Chewas were not the majority tribe. So we have decided to learn the language of our closest neighbours, the Tongas. Wish us luck!